We know that power tools can be pretty scary if you’ve never had any experience with them. There’s no need to worry because you can still create amazing projects without losing a finger! 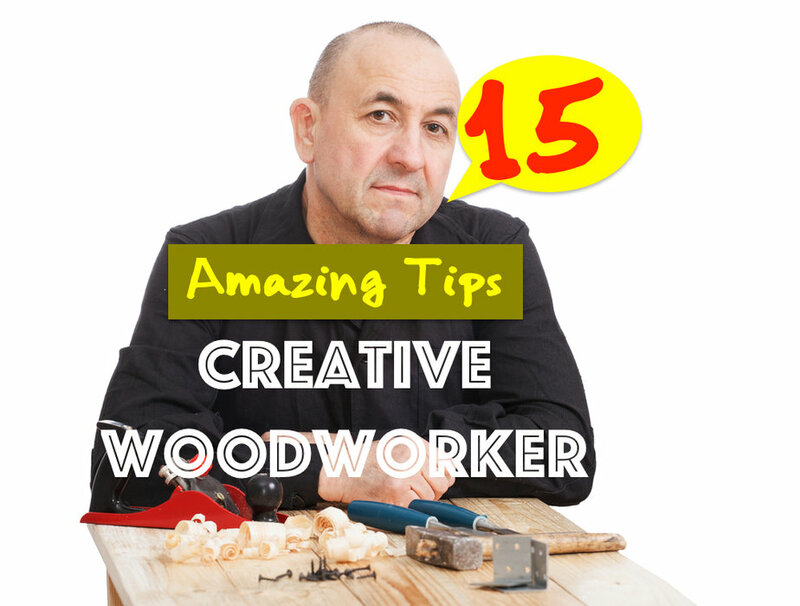 Go unplugged for your next creation, for here are 15 tips we have on woodworking without power tools. Woodworking glues are handy if you don’t like using a drill. There are many types of wood glue depending on the wood you’re using. Not sure what type to get? You can learn how to choose the right type of glue here. A claw hammer is one of the many woodworking hand tools for beginners of their craft. If you need to drive in nails or pull out nails, a claw hammer is the most useful and flexible. It takes more time than a nail gun, but patience wins over a shaky misfire, don’t you think? Dovetail joints are like the clever counterpart to nails. It’s like putting puzzle pieces together! Many woodworking projects use dovetail joints if you decide to get a bit more decorative. Dovetails are known for their resistance to being pulled apart, and if glued together, you don’t need to apply mechanical fasteners. A set of sharp beveled chisels is often great to have in your toolbox. You can cut your dovetail joints, add decoration to your piece, and hundreds of other uses. Paired along with a rubber mallet, you’ll be glad you didn’t plug in the circular saw. You can never have too many clamps in your workshop. They can make things a lot easier to handle. They’re convenient when you need to hold parts of your woodworking project steady while you work. Along with wood glue, clamps can press pieces together for a tighter stick. Instead of buying a dremel rotary tool to sand, you could sand your projects by hand. We know hand sanding takes a lot of time and hard work, but it’s one of many skills that can help you improve as a woodworker. You may also feel more in touch with your project instead of distancing yourself with a power sander. Power saws can be frightening to use. Who doesn’t fear to lose their thumb with those things? Using a hand saw may take a bit of elbow grease, but it’s certainly a safer alternative than a circular saw or a jig. As long as your hand saw is sharp, your cuts will be too! There’s always the option of going to your local hardware store and picking up some 2x4s. You can choose to hand saw these yourself at home, or have the store’s wood expert cut them for you. Either way, you don’t need to even touch a power tool. There’s tons of projects you can accomplish with 2x4s, and these are just a few examples. 9. Adding Fabric to Your Project? Use a Staple Gun. A staple gun is simple to use and doesn’t need a power outlet to work. You can most likely buy one from your local arts and crafts store. With some fabric of your choosing, you can use the staple gun to attach the fabric to wood. It’s great if you plan on making a nice patio bench or ottoman like this. You can even use it to save yourself some sanding time if your pins stick out in your dovetail joints. Not every type of wood may be suitable to work with, especially when you don’t want to use power tools. Should you work with hard wood or soft wood? That depends on what you’re building. Fixing up furniture like old shelves or desks are part of being a creative woodworker. Aside from possibly pulling out a few rusty nails, repurposing doesn’t really call for using any extra effort or power tools. Strip off that old veneer, lay on some paint, and voila! Your old furniture looks good as new! A power saw can typically cut your pieces in a straight line when you need it to. But when you don’t want to use such a scary machine, it’s important that you have a straightedge ruler. It’s better not to eyeball measurements and guess for a straight cut. Line guides make for even cuts. You can buy any size ruler you want that’s appropriate for measuring out your pieces. If you’re a generally tolerant person, a hand cranked drill might be an ideal investment. This tool can do the same job that an electric drill can do. You can safely drill holes into your wood, and you’ll get a feel of how the masters crafted back in time. For smaller woodworking projects, advanced strength glue dots can hold two pieces together very well. Glue dots are easier to work with than wood glue if you don’t like to worry about sticky fingers. It may sound odd to use glue dots for projects, but you can save lots of time. They’re nice for projects like these! Quality projects are totally possible to make while woodworking without power tools. Basic woodworking hand tools for beginners in the craft can help build up your creative skill. Remember these tips the next time you get started on a project!